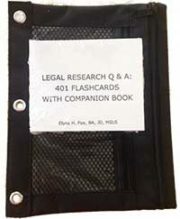 401 flashcards printed on heavy card stock with storage bag and companion looseleaf book. Complements The Legal Research Dictionary: from Advance Sheets to Pocket Parts and Legal Research FAQs: 189 Ready Answers. Full description below. 1 copy: $100; 2 copies: $190; 3 copies: $280; 4 copies: $360; 5 copies: $440. Fun, portable, effective! A practical refresher tool and educational tool for librarians, law students, lawyers (and summer associates), paralegals, and legal researchers. Law schools teach legal research with our flashcards. Over 400 flashcards printed on heavy card stock with storage bag and companion looseleaf book. Three types of questions: true/false; multiple choice; and fill-in-the-blank. Unpublished opinions may subsequently be designated for publication (true/false). Broadly speaking, what categories of legal authority are considered statutory? Constitutions; legislation; treaties (federal); administrative rules (delegated legislation); court rules; interstate compacts. c. They are not authority; they are only finding tools. Author: Elyse Fox, BA, JD, MSLS. Ms. Fox has worked as a law librarian for 30+ years. She previously practiced law in Chicago and Boston. She also taught legal research to law students. “This invaluable pedagogical tool provides law students, law librarians, lawyers, and summer associates with an effective means of mastering the basics of legal research and legal bibliography. The flashcards ask three types of questions: fill-in-the-blank, true/false and multiple choice. The questions cover the following types of publication or topical areas: legal research generally, authority, court reports, statutes, legislative history, administrative law, court rules, attorney general opinions, digests, citation, citators, and law books. Kendall Svengalis, Legal Information Buyer’s Guide and Reference Manual.